1 FTS at RAAF Point Cook (© 1991 - 2010 Carlo Kopp; M645/1000S). The RAAF is on the threshold of what can only be described as a fundamental structural change in its pilot training scheme. Central to the new philosophy is the use of the new PC-9 as principal training aircraft, and the adoption of civilian contractors to carry out initial aptitude screening. While the full benefits of the new approach remain to be demonstrated, it is clear at this time that the RAAF will enjoy a much higher standard of candidates for actual flight training which will result in a lower washout rate while retaining the RAAF's high standard of graduate. In this fashion the resources applied to flight training will be utilised far more efficiently, as the expense of training candidates who will fail is minimised. The RAAF's recruiting and training mechanism is in many ways different from any of its civilian counterparts. This is for some very good reasons, all of which revolve about the fundamentally different environment within which military pilot must function. Military pilots must demonstrate not only a high standard of airmanship flying high performance aircraft, they must also function in hostile airspace under the pressure of very high sortie rates. To this must be added the tactical skills relating to the application of the aircraft's offensive and defensive systems. Saturation with information is a fundamental issue in this environment and the military pilot must therefore have a proven capacity to handle his platform effectively while bombarded with stimuli from weapon system sensors and threat warning sensors. This places much higher demands upon the pilot's ability to cope with workload on sorties, but also demands individuals with the ability to handle very steep learning curves. To these parameters must be added the requirement for leadership ability, the combination of personality characteristics and confidence which is necessary for command under fire. Leadership potential can be a careerpath death warrant for a young professional in the civilian world, where initiative and responsibility is usually discouraged and severely penalised. The military actively seeks individuals with leadership potential and much of the training process is oriented toward developing any natural qualities the candidate may have. The military pilot training scheme must therefore produce not only good aviators, but also good officers with a well developed understanding of air warfare and the cultural and structural idiosyncrasies of his (or her) service. The established recruitment and training scheme evolved over the last two decades, a period during which the RAAF has seen considerable changes in its tactical inventory. The pressure for change has come both from within the RAAF and from the government, the RAAF seeking to improve the quality of the training process and fully exploit the new PC-9 aircraft, while the government not surprisingly seeking to cut costs. Fortuitously, the RAAF is in the position to please its masters without suffering a decline in the quality of its graduates, as has been experienced by much of the civilian tertiary education system. To fully appreciate the scale of this change, we must first take a closer look at the established training scheme and consider its strengths and weaknesses. A applicant seeking to become an air force pilot would initiate the process by approaching a recruiting office. Providing the applicant was of the appropriate age and educational standard, he would then submit to a preliminary medical test to screen for major problems such as eyesight/hearing defects or other serious deficiencies. Subsequently, the applicant would undergo a written aptitude test, a coordination/motor skills test and an interview with a psychologist and a recruiting officer, the latter more than often not aircrew by training. The objective at this point is to screen out applicants with who are medically unfit, lack natural aptitude or suffer personality disorders which would make them unsuitable for the military. Those applicants who pass at this point are then recommended for an interview with a selection board, comprised typically of a senior officer from RAAF Personnel Division, his assistant, a psychologist and a QFI (Flying Instructor). The interview typically takes three quarters of an hour, and the board will attempt to understand the applicants' motivation and interest in becoming a military pilot and officer, while also taking a closer look at his/her personality traits, skills and natural aptitude for the task. If the applicant survives the selection board interview and is recommended, he is graded and placed on a centralised list. Once the grading process for the given intake is completed across the nation, the required number of applicants are accepted from this list, in the order of grading. If the number of applicants on the list exceeds the number required for the intake, the excess with the lowest scores are rejected. The successful applicants are then offered entry to the course. This preliminary selection scheme had the perceived advantage of minimising up front expenses, tightly screening out unsuitable applicants at a very early stage. Upon closer examination however it is clear that a snapshot over a period of several hours of interviews is unlikely to provide a very deep insight in the applicant - qualities such as tenacity under pressure, ability to work in a team environment, ability to lead under pressure and ability to coordinate and prioritise tasks under pressure in flight remain at this point unknowns, their presence or absence assessed only in the subjective estimates of the officers in the selection panel. If the applicant has failings in any of these areas, they may not become apparent until well into the training process, resulting in a washout, grief to the failed applicant who has by then a much greater personal investment in the process, and last but not least, taxpayers' money expended. Applicants who accept their offer then enter the Officer Training School for a period of 13 weeks, during which they learn the internal culture, customs, procedures, law, history, administration and structure of the RAAF. Concurrently they are taught basic leadership skills, self discipline and personal management. The OTS is not merely a machine for cultural indoctrination, as extensive physical training exercises are practiced throughout to bring the officer candidates' basic fitness and stamina to the point where they can function effectively under severe stress. Physical stress is an important tool as it effectively exposes much of the candidates' basic personality, particularly his or her tenacity and depth of commitment. The candidates who successfully master the OTS are then subjected to two days of AvMed (aviation medicine) to familiarise them with the physiological effects of flight at high altitudes. A second component of AvMed covering ejection training is then carried out just prior to entering 2 FTS advanced training. At this point the candidates enter ab initio flight training, with the 1st Flight Training School (1 FTS) at Point Cook, on the outskirts of Melbourne. The Point Cook course covers Phases 1 and 2 of the syllabus, with 52 hours on the CT-4 tricycle piston basic trainer. Phase 1 covers handling aircraft controls, circuits, elementary aerobatics, forced landings and an introduction to 3D flying (unusual attitudes). After 25 hours the students submit to a GF Progress Test (General Flying) where their progress is assessed. Phase 2 at Point Cook continues with initial IF (8.3 hr) and Night VFR (NF - 3 hr) training, dual and then solo navigation (6.7 hr) with further GF training (10 hr) including more advanced aerobatics such as the roll off the top and barrel roll. The established flight training scheme had a reputation for placing students in a 'sink or swim' situation with considerable pressure to perform and limited support for students with problems, the philosophy of having progress tests are pass/fail targets to work to often created problems within itself. Students with confidence problems generally found their performance deteriorated under the pressure of the test, further exacerbating the problem. Apparently there is still some debate within the RAAF as to whether this is desirable or not, as the harsher environment is argued to produce a better tactical pilot. Students who passed Point Cook then entered Phase 3 of their training with 2 FTS at Pearce in WA, just North East of Perth. Until recently, all 152 hours of advanced flight training were flown on the turbojet powered Macchi MB-326, at this time the geriatric Macchis are being replaced with the new turboprop Pilatus PC-9. Phase 3 involved transition to the new aircraft, and blocks of GF (29 hr), IF (10.6 hr), NF (5 hr) and Nav (3 hr) training. Students passing the Phase 3 GF and IF Progress Tests entered Phase 4 which comprised blocks of GF (18 hr), IF (14.4 hr), NF (3.3 hr), Nav (12.1 hr) and formation training (7 hr). The emphasis is not only on developing the student's confidence and skills, but also upon doing so in a balanced fashion so the student can remain reasonably current across the spectrum throughout the course. Phase 4 saw the students undergo further GF and IF Progress Tests, the latter if successful resulting in a student IF rating. The final phase of the students' flight training is Phase 5, with blocks of IF (8.4 hr), NF (2.3 hr), Nav (16.5 hr), Formations (12.3 hr) and GF(16.6 hr). Phase 5 was finished with a battery of tests covering Formation flight, final IF, Nav and the Wings Test. At this point the successful students will be sent off to operational conversion training to fly tactical jets or multiengine aircraft. By this point they will all have demonstrated where their best talent lies and the RAAF will attempt to reconcile these factors with the students' careerpath interests. The flight training syllabus is paced by an extensive ground training program, which includes aerodynamics, aircraft systems, airmanship, air traffic control, aviation medicine, cockpit systems and instrumentation, radio, administration, meteorology, morse code, military operations, navigation and PT. The strength of the RAAF's established training scheme has been the ability to produce good quality military pilots, but it has done so with a fairly high washout rate due to the nature of the screening process employed. The use of separate basic and advanced training aircraft types increased support costs and consumed some hours of training time in type conversion. The heavy bias toward assessment primarily through Progress Tests penalised those students with confidence problems. This has been clearly recognised by the RAAF and has been reflected in the structure of the new training scheme. The RAAF's new flight training scheme differs in two principal areas from the established scheme - it utilises the PC-9 as a single training type from ab initio to advanced training and it employs a civilian contractor to provide initial aptitude screening, while also providing more comprehensive training for Army and PNGDF students. Much of the existing structure and syllabus is retained, but important refinements are introduced in a number of areas. The selection process again commences in the recruiting office with preliminary medicals, written tests, psych tests and a coordination/motor skills test, this to be the AusBAT (Australian Battery of Aptitude Testing) test which has the applicant responding to visual and aural stimuli at varied rates while under eye/hand/foot coordination testing. The one-on-one interview will have the applicant interviewed by a QFI rather than a non-flying officer to provide the student and service with a more accurate mutual insight. The selection board on the other hand is a dedicated officer selection board, with no QFI on the board. The board will select a number of applicants for initial flight screening. The flight screening program will see a civilian contractor provide aircraft, instructors, ex-RAAF QFIs and facilities for the program. There are no flight training objectives at this point, as the 2 week 15 hour syllabus is oriented toward identifying applicants with natural aptitude for flying and personality suitable for officer training. The latter criterion is an important argument for why the RAAF has specified co-located accommodation and flight facilities, as the applicants will come under close scrutiny for the whole period. The objective is for the service to gain a reliable insight into the applicant, rather than the less accurate snapshot resulting from recruiting office interviews. Another argument is that of fairness, with accommodation located away from the aerodrome, some applicants would be penalised by different travel times and a potentially unsuitable ground study environment for after hours homework. While there has been some debate in the GA community about the RAAF's RFT being written about a handful of larger organisations, the nature of the process being implemented suggests the RAAF has little choice in the matter. The RAAF will have enough difficulty in defining performance criteria to be met by tenderers, and are seeking organisations for which the flight screening program represents only a minor component of workload, as the RAAF student intake can fluctuate considerably over time. Stability is a fundamental requirement for the RAAF in this area, as the training cycle stretches over an 18 month period and it is only by looking at the detailed statistics at the end of each cycle that the contractor's performance can be accurately assessed. The 2 week Flight Screening program is split into two phases, Phase 1 involves 10 hours on a tricycle side-by-side dual trainer, and covers taxiing, takeoffs, landings and general aircraft handling. The RAAF flight instruction/assessment will be carried out by ex-military QFIs, followed by an assessment test by a military QFI (typically 2 ARA, 2 RAAF, 1 RAN, 1 PNGDF QFIs will be attached to the school, with a psychologist to provide support). Phase 2 follows similar lines, with 5 hours of time on an aerobatic side-by-side taildragger. Phase 2 objectives concentrate on aircraft handling and coordination, with some aerobatics thrown in. A fundamental objective common to both phases of assessment is establishing the applicants' ability to handle the very steep learning curve associated with the flight training process. It is in this area where the process will diverge between RAAF/RAN applicants and ARA/PNGDF students, as the latter will receive instruction from civilian instructors only with flight tests being carried out by military QFIs. The ARA/PNGDF training syllabus is carried out largely by the civilian contractor. This reflects the different workload environment which exists for the low/slow two crew Army support role, which is fundamentally different from the single pilot high workload mission of the RAAF and RAN pilots. By the end of the flight screening process the RAAF will have a very good idea of how well the applicant will handle flight training, while also gaining a good insight into the applicant's ability to function in a team environment. Those applicants who pass the flight screening will have had the benefit of knowing to some degree what awaits them in the flight training phase, this in turn bolstering their confidence and reducing washouts due confidence problems in the earlier phase of training. The RAAF is aiming for a 80% pass rate for students which have successfully passed the screening phase. At the end of the screening process a selection board will review the applicants. The Chairman of the Selection Board will be a Wing Commander from HQ Training Command, usually SOAT (Staff Officer Air Training), board members will include a senior service QFI and an FTS psychologist. The board will set the grading order of the applicants, this determining which applicants will proceed to the OTS and later FTS. A major concern which has surfaced for the RAAF is the possibility that applicants may have difficulties getting 2 weeks of leave on short notice and that many employers will not take kindly to staff members pursuing an alternate careerpath. The possibility of an applicant losing a full time job to go on a 2 week screening course which he/she fails is considered to be a potential problem area, as it may discourage many would be applicants, and cause others undeserved hardship. Many employers seek stability even at the expense of mediocrity and may penalise employees who would like to pursue an alternate career, seeing this as a sign of a highly undesirable attribute, ie initiative. The OTS training course remains as previously, a 13 week course. On completion of the OTS students will undergo 1 week of AvMed, which includes ejection training and high altitude training. This is a refinement in comparison with the earlier approach, to a large degree necessitated by the use of an ejection seat equipped aircraft for ab initio training. The 3 week combat survival training course in Townsville, which covers jungle and blue water ocean survival techniques, is advanced to this point in the new system. This is considered to be a major improvement, as students will have a higher confidence level earlier in training, knowing how to cope if they must eject on a Nav in a remote area. Navs in the new system are expected to cover a greater variety of areas than previously, due the presence of VOR on the PC-9 in addition to the DME and Tacan. The pilot course at 2 FTS Pearce is entered at this point, using the PC-9 from the outset. Phase 1 of the course concentrates upon GF (15 hr) and takes the student to his solo. Phase 2 follows with blocks of GF (29.6 hr), introductory IF (19 hr), NF (5.8 hr) and initial Nav (7.5 hr). Phase 2 ends with GF and IF Progress Tests. A fundamental emphasis in the new pilot course is to consider Progress Tests a necessary formal part of the process, but not to allow students to the test until their QFI is confident the student will pass successfully. Only if a student fails to respond to remedial effort will he/she be washed out, typically without going to the test. Phase 3 continues with a composition identical to the earlier Phase 4, and ends with Progress Tests in GF and IF. A similar arrangement exists with the final Phase 4, which replicates the syllabus of the earlier Phase 5, and ends with final and wings tests. Students who will progress to tactical jets (F-111, F/A-18) will undergo jet training in the Macchi, before transfer to a Operational Conversion Unit for type specific training. The ground training syllabus is unchanged in structure, although some areas will involve detail changes to accommodate the new aircraft and sequence of training. It is clear that the RAAF's new training scheme is an evolutionary development of the existing scheme, retaining much of the later syllabus but fundamentally changing the initial steps in the process. The result will almost certainly be a more efficient system, providing applicants with a better chance of succeeding and reducing the losses associated with later washouts. An additional benefit to all parties involved in the process will be the healthy cross-fertilisation resulting from interaction between the GA community and the military. We can hope that the next half decade will convincingly demonstrate the wisdom of current decisionmakers. 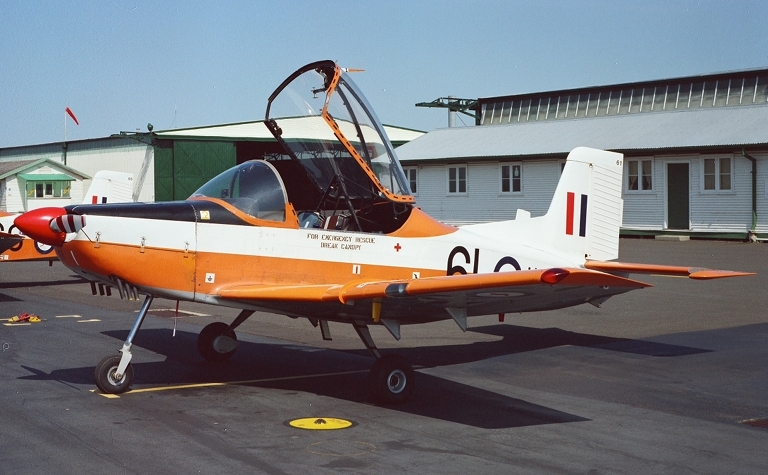 1 FTS CT-4A Parrot at RAAF Point Cook in 1991 (© 1991 - 2010 Carlo Kopp; M645/1000S). 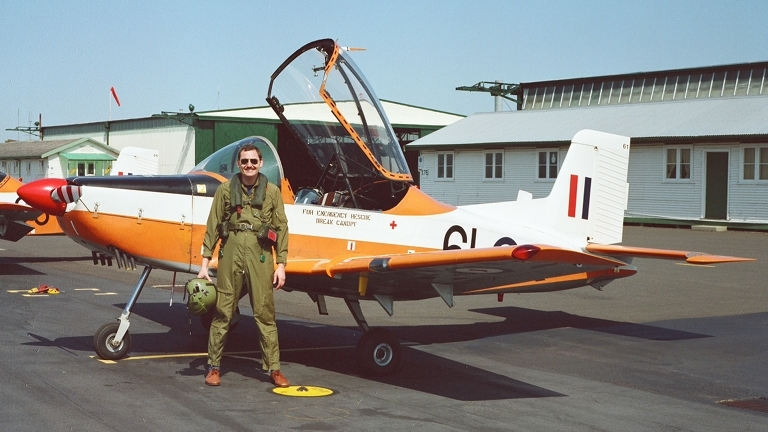 The CT-4 has faithfully served the RAAF as a basic trainer since the early seventies, turning out a generation of pilots. Affectionately known as the Parrot, the CT-4 has all of the attributes which make a good basic trainer, it is docile, predictable and a pleasure to fly. Australian Aviation had the opportunity to recently fly this aircraft, soon to be phased out of the RAAF's inventory, and found the Parrot to be well deserving of its reputation. The CT-4 is a derivative of the Victa Airtourer, and was customised for the military basic training role by structural strengthening, the use of a hinged bubble canopy and the fitting of military style stick/pedal/throttle controls. In comparison with civilian basic trainers such as the Piper PA-28 family, the CT-4 while of similar fixed tricycle configuration, has a smaller wing with a higher loading, a much more powerful engine, vastly superior visibility and is of course fully aerobatic. This translates into an aircraft which in the author's opinion is a far better basic training platform due to not only a better envelope, but is also much easier to handle in the circuit and is far more tolerant of mishandling in unusual attitudes. The aircraft flown was A19-61 and the author flew with Flt Lt Chris (?) 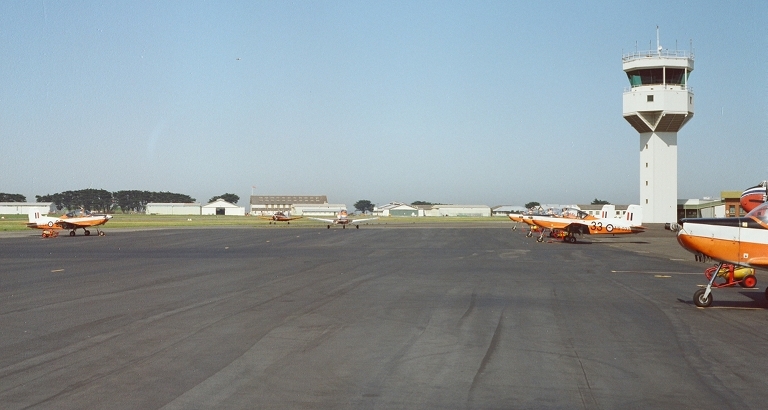 Abbot, a RAAF QFI with 1 FTS at Point Cook in Victoria. The weather conditions on the day were optimal, CAVOK with light and variable winds which allowed for some basic aerobatics in addition to handling familiarisation and circuit work. The first impression is of an aircraft which is solidly built, all metal and very structurally robust. Ground preflighting is standard for a small piston, with checks on control surfaces, prop, engine and fuel. Access is over either wing, and the flaps are sufficiently solid to stand upon on marked areas, unlike its civilian counterparts. The cockpit is spacious by any standard, with large and comfortably adjustable pedals, centrally mounted control sticks and dual throttle, pitch and mixture controls on consoles on the left hand position to either of the two side-by-side seats. The pleasant surprise upon strapping in is the superb all round visibility conferred by the large bubble canopy and single piece bubble windshield. The canopy is latched via a central handle to the windshield frame and can be left cracked open for taxiing, well worth doing in consideration of the glasshouse heating experienced in sunny conditions. The RAAF fly the Parrot in standard overalls, wearing flotation vests, helmets and optionally backpack parachutes, this somewhat complicates the strapping in procedure as one has additional straps to worry about and an additional shoulder harness lock to engage. By all means an interesting experience for us jeans/T-shirt/headset aviators. The cockpit layout is quite conventional, the notable difference being in the use of electric trim throughout, with a panel mounted rudder trim and control stick mounted aileron/pitch trim. The powerplant is a flat six Continental IO-360-H rated at 210 HP, with a button operated starter and rotary switch for magneto selection. The aircraft taxis comfortably and with the exception of more extensive RAAF checklists, getting through the runups, pretakeoffs and to the holding point is no different from any other small piston with a constant speed prop. On takeoff the extra horsepower is quite noticable and for those accustomed to the C-172 and PA-28, it will be quite refreshing. The aircraft is rotated at 60 kt and requires little rudder to maintain a precise track down the centreline. The first impression of the controls is of smoothness, the CT-4 exhibiting the pleasant firmness which is typical for the military trainer. We climbed out at 90 kt toward the training area to the South-West of Point Cook, the aircraft maintaining a steady climb rate of about 600 fpm at 26 inches. At 2,500 ft we levelled off to carry out some gentle turns and some steep turns. Control response is quite precise, with very little overshoot in all three axes and rolling out from turns, very little opposite control input is required to arrest the turn. Slight backstick is required in a steep turn to maintain the correct attitude, and the aircraft feels very comfortable throughout the manoeuvre. I put the aircraft through a series of small pitch, roll and yaw control inputs and the aircraft attains the commanded rate quickly and smoothly, and similarly upon centralising the control, smoothly recovers attitude without the typical underdamped response of most civilian trainers. At this point, we commenced some basic aerobatic manoeuvres, Chris initially demonstrating the manoeuvre, then setting up for a repeat of the the manoeuvre and handing the aircraft over. Standard aerobatic power is 2600/26 inches and entry speeds are 130 kt for rolling and 150 kt for vertical manoeuvres. The elevator is surprisingly sensitive in the loop, and little backpressure is needed to maintain the required 3.5 G. The smoothness of the controls is again apparent, and the aircraft will fly a very nice loop with little control force required to maintain the appropriate load factor through the various phases of the manoeuvre. The CT-4 rolls nicely and recovers cleanly, the low moment of inertia due the small wing is a distinct benefit in comparison with civilian trainers such as the Decathlon. The stall turn is also flown very easily, with a little forward stick required to maintain the plane of the turn, with full rudder and opposite aileron. Entering the latter phase of the stall turn, little opposite rudder is required to arrest the yaw rate into the nose down attitude. The overall impression is of an aircraft which is very pleasant to aerobat and requiring little effort to manoeuvre well, any reasonably experienced aerobatic pilot will find it both easy and comfortable to learn. The controls are sufficiently sensitive to provide for precise handling through the manoeuvre, without the poor damping which is characteristic of some civilian aerobatic trainers. Having completed this phase of the flight, we returned to Point Cook for some circuits. The CT-4 handles nicely in the circuit and little effort is required to maintain track and attitude on final. The aircraft sinks gently in the flare, with no observable tendency to balloon or float as is typical with lightly loaded aircraft. Application of power during the touch and go results in very quick acceleration to flying speed and little backpressure is required in spite of the trim set for finals. The CT-4 is an easy aircraft to land and again little practice will be required to fly precise circuits. We carried out several circuits before the final full stop, the RAAF oval circuit requiring some getting used to (RAAF circuits differ from the civilian rectangular circuit, in that the crosswind and base legs are collapsed into continuous turns from upwind to downwind, and downwind to final respectively). The Parrot is the nicest basic trainer the author has had the pleasure to fly, and is well worth the consideration of enthusiasts seeking an aerobatic side-by-side seated tourer. With the 1 FTS aircraft due for disposal upon the introduction of the new RAAF training scheme, the CT-4 will hopefully become available to the private pilot. The Parrot will no doubt be missed by many RAAF pilots but hopefully its eventual emergence in the civilian training market will allow others to enjoy this pleasant little aeroplane. 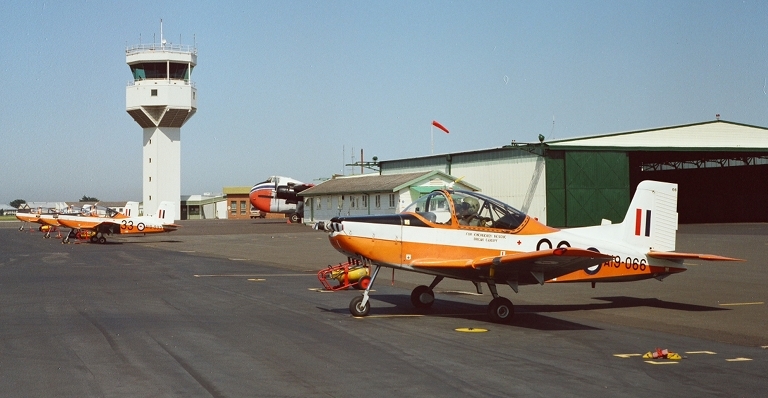 1 FTS CT-4A Parrot and author at RAAF Point Cook in 1991 (© 1991 - 2010 Carlo Kopp; M645/1000S).